Current conservation issues affecting Bay Area birds and wildlife. Bay Area birds and birding hotspots. Upcoming guest speakers and other events. News about GGAS’ initiatives in environmental education, conservation, and other areas. Current and past issues are available on this website. Have The Gull delivered to your door every other month by becoming a paid GGAS member! Better yet, have it delivered to your computer or mobile device electronically. You’ll receive an email link to the online edition about a week before the print version — plus you’ll save trees, and save postage costs that can be put to use for conservation and education work. To read The Gull online instead of receiving it by mail, please contact our office at ggas@goldengateaudubon.org or (510) 843-2222. The new edition of The Gull newsletter for Spring 2019 is now available online. Read about the contributions of GGAS volunteers and everything they do for Bay Area birds. Also read about the Lesser Goldfinch, community science through SFBayOspreys.org, and everyone who is going above and beyond by fundraising and leading trips for Birdathon 2019. Of course this issue of The Gull also includes upcoming GGAS events and our Speaker Series in April, May and June. Click here to read it: TheGull_Spring19. P.S. 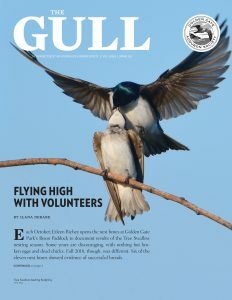 If you’re a GGAS member who receives the printed edition of The Gull by mail but would like to switch to online delivery by email, contact our office at ggas@goldengateaudubon.org. It saves postage and paper, plus you’ll get your copy earlier than by post.